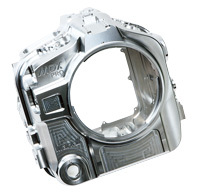 The aluminum material used in the MDX series housings realizes a body that is both lightweight and strong. Because we envisioned photographers’ harsh usage environments, the body was successfully brought to an even higher level of perfection through the implementation of anodized aluminum processing. The all-new high-rigidity, high-durability, high-precision MDX series demonstrates the highest levels of performance under a variety of shooting conditions. *The image shows the rear case. *The MDX-PRO Mark? housing comes from the factory with these bulkhead connectors: one type-N (2-pin wired) connector and one 6-pin (6-pin wired) connector. Controls almost all of the Canon EOS-1D/1Ds Mark III’s essential functions underwater. 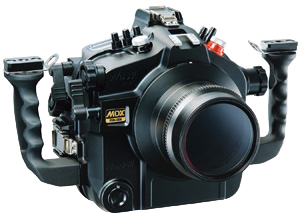 Compatible with the Shutter-activated Focus Light (optional, factory modification is required).